Understanding your options after Aiglon is a long process. Fortunately, the College & Careers Counselling Office is there every step of the way. Are you curious what you, your son or daughter should be thinking about this time of the year in terms of applications? Check out this list that the College & Careers Counselling Office have put together. Be sure to contact them if you have any questions! Meet with college counsellors throughout autumn term. Complete all applications, personal essays or personal statements by posted internal deadlines. Take final US or UK admission testing (if needed). 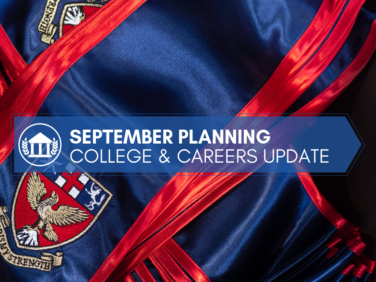 Meet with university admission representatives visiting Aiglon (autumn and summer terms). Continue strong IB class performance (predictions released in October and updated in December). Prepare for university interviews (if needed). First presentation from the College and Career Counselling department (3rd September). Consider which countries and programmes are of particular interest for higher education goals. Conduct online research; talk to counsellors; talk to teachers. If thinking of the US, then SAT preparation should be planned in the year ahead (AlphaPrep SAT/ACT preparation course running at Aiglon in January). SAT testing is offered in December, March, May, October; SAT subject tests (if required) are recommended June and November 2019. Plan to take official university tours during school holidays (October, December, February, March and summer 2019). Meet with college counsellors at any time with questions (official meetings in January 2019). Focus on academic achievement (IGCSE or Pre-IB programmes). Participate in activities that develop personal strengths, talents or skills. Identify academic areas of interest. Meet with college counsellors at any time with questions.